Switching material from plastic to paperboard can reduce a packaging’s climate impact by 99 per cent. For people who influence the choice of packaging material, this single choice can make the biggest climate impact during a product manager or designer’s entire professional career. That’s the conclusion of a study done by IVL Swedish Environmental Research Institute for Iggesund Paperboard. “There are tables giving carbon dioxide emissions per kilo of material, but when you compare real examples of packaging, you realise the great importance of the choice of material,” comments Johan Granås, Sustainability Director at Iggesund Paperboard. 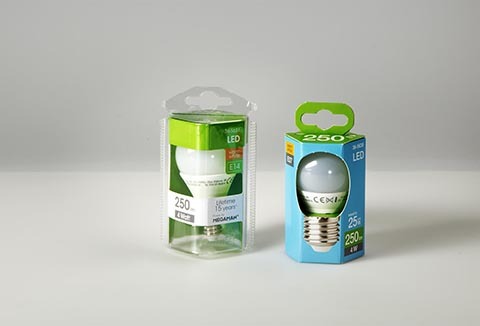 Packaging light bulbs in plastic or paperboard respectively is the most extreme example in the survey. By switching from plastic to paperboard, it is possible to reduce the climate impact of the packaging by 99 per cent. In the example that was most favourable for plastic, a paperboard carton containing 500 grams of pasta was compared with the corresponding amount of pasta packed in a thin plastic bag. The conclusion was that the plastic bag has a 3.25 times larger climate impact than the paperboard carton. This is despite the fact that the bag only weighs one-sixth as much as the carton and has significantly worse protective and stacking properties. For the paperboard packagings used in the study, climate data for Iggesund’s paperboard Invercote was used. For the plastic materials, IVL drew on data from the databases used for doing lifecycle analyses. None of the paperboard packagings used in the study is made of material from Iggesund Paperboard. “This is a study that shows the climate impact of different types of packaging. The mandate to IVL was to be general. Neither they nor we know the climate data for each individual packaging. However, based on the recognised environmental databases, this definitely indicates the great importance of the choice of material,” Granås concludes. IVL Swedish Environmental Research Institute was jointly founded in 1966 by the Swedish government and industry to do research into industry’s air and water management issues. Today IVL is an environmental institute that focuses on the interplay between environmental, economic and social perspectives. In extreme cases, switching packaging material from plastic to paperboard can reduce a packaging’s climate impact by up to 99 per cent.